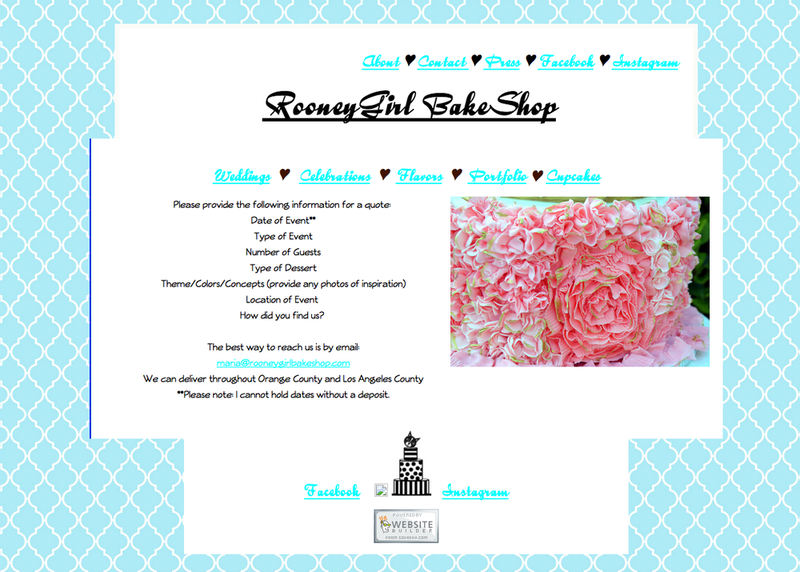 As the editor of a successful wedding blog for 8 years, I became very accustomed to wedding details and which wedding details I loved most ... and I grew a sweet spot in my heart for cakes ... especially those cakes created by Orange County wedding cake designer Maria of RooneyGirl BakeShop. When I decided what key elements Maria's rebranded and redesigned website would have, I wanted to make sure it was clean, organized, uncluttered, and focused on what she does best: gorgeous wedding cake design. Because wedding cakes come in many colors, I wanted the site to be mainly white with black accents so that any cake displayed there would be the hero and would be in the spotlight. It was important to me that Maria had her cakes displayed in as many areas as possible so that potential clients could see her wide range and the endless possibilities. I created a sidebar in her new blog that demonstrated the collection of cakes Maria has designed so that on every page they were reminded of her craft. Each image is search engine optimized for that specific style and when the images are Pinned, that text will follow in the description. If you are a wedding pro who creates a specific detail, like wedding cakes, you want to make sure the images speak for you ... wedding cakes are something you need to SEE ... and I feel that this redesign creates a visual experience that can't be ignored.